SRI LANKAN PEPPER-CUMIN DRY BEAN CURRY. SRI LANKAN DRY BEAN CURRY MIXED IN WITH SAUTÉED ONIONS. 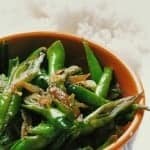 MAKE THIS SIMPLE BEAN CURRY AND ENJOY A TASTY VEGETARIAN, GLUTEN-FREE, LOW-CARB SIDE DISH. WITH PEPPER AND CUMIN AS THE MAIN SPICES FLAVORING THE DISH, YOU’LL BE SURPRISED HOW GOOD IT TASTES. Pinch the ends of the beans and remove the string that runs on both sides of the bean. cut the beans to the required size. Pour in the oil to a skillet. On medium heat, cook the sliced onion with the Cinnamon until onions turn translucent. Add the Beans, cook over medium heat for 5 minutes.Once the beans are semi cooked add the Cumin, pepper. Reduce heat to low and cook for a further 15 minutes. before removing the pan from the fire add Salt to taste. You also have the option of adding 1/2 cup of coconut milk to give the beans extra creaminess.